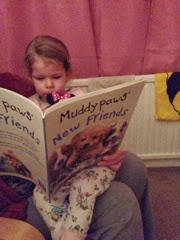 We received our January Parragon Book Buddy review which was 'Muddypaws' New Friends' by Steve Smallman & Simon Mendez. My girl went mad for this book, at Christmas we had the Muddypaws book which duly went back in the loft until next year. We read this book every night as Bubba loves dogs so you can imagine the effect a new book about puppy's was. It was even better timed because this book is all about new friends, the lovely muddypaws goes to puppy school and meets two other little dogs and makes friends as they all play around. It also acts as a reminder that although you make new friends, your old friends are just as important. Bubba started preschool in January so for her at the moment its all about making new friends but I'm hoping she doesn't forget her old friend (that's me!). 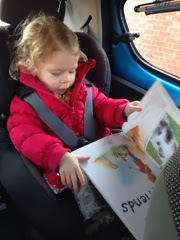 This book comes every where with us, in the car to preschool, a nice before bedtime read, during the day when she makes me sit and listen to her retelling her story and it's even come to the supermarket. She has named us all as the main characters - I'm Muddypaws, daddy is Patch (the cheeky little dog) and my girl calls herself Droopy (the little beagle with long ears). It's a very cute and family friendly book and I'm looking forward to reading more in the Muddypaws' series. For more book reviews and news head over to the Parragon Book Buddy Facebook page.